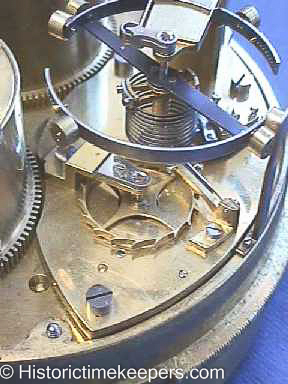 Historic Timekeepers is a full service shop; if a part is out of production, we make it. This includes watch and clock parts from balance staffs to dead beat pallets. Serving Collectors and Professionals since 1981, Historic Timekeepers has established its name in the restoration of fine vintage timepieces and providing professional products that assist others involved in the restoration of timepieces. In 2010 I was invited to a training program in Neuchatel, Switzerland. This WOSTEP program, only offered in Neuchatel, is considered to be a graduate school for watchmakers. I graduated from both the refresher course and the turning course and am certified in after sales service of current production watches (chronographs, calendar, automatic and time only watches) and micromechanics (making parts). This is why I was closed for 2010. As partial repayment to those who helped me, I am creating pages of value to younger watchmakers. One very rarely discussed topic Measurement in Watchmaking, is discussed in detail. And then there are my Notes to Young Watchmakers. It is easy to say I am qualified to perform the restoration work on your watch or clock. This is one reason I publish photoseries of the machining of various parts (see Photoseries Index ). After looking at some of the examples of completed parts, you can decide for yourself if I am qualified to restore your timepiece. For a tour of the shop with a discussion of my setups and equipment go to Shop Tour. Here is a discussion of my approach to servicing your timepiece. We are proud to be an Omega Recognized Service Provider. Many of our customers have asked us to provide after sales service for their current production wrist watches. To this end, we have completed Omega service center training covering products that use the Co-Axial escapement. We have equipped the shop to correctly open modern cases, replace crystals, service and time automatic watches, and leak test cases. We can service essentially any watch in current production, from time only automatic watches to wrist chronographs with day/date. If parts restrictions prevent us from ensuring access to parts we may need to replace in the course of service, WE WILL TELL YOU and return the watch with directions how to obtain factory service. We WILL NOT attempt to "make do"; it is not our way. Historic Timekeepers is proud to serve aircraft owners and those who maintain vintage military aircraft (Warbirds) in particular. We service ALL mechanical aircraft clocks (Jaeger LeCoultre, Elgin, Hamilton, Kienzle, Junghans, Seiko, Waltham, Longines, Wakmann, Mathey Tissot) and we maintain an inventory of refurbished WWII aircraft clocks from US, British and German air forces. Whether you use an aircraft clock as a desk clock or in your instrument panel, we service it or likely can provide it. Service information can be found at Aircraft Clock Restoration Services and clocks for sale can be found at Warbird Clocks for Sale . Many people are under the impression that replacement parts have to be made with trial and error methods using hand tools. The simple fact is that such "handmade" parts usually result in a devalued piece that fails to function properly. With the proper equipment and knowledge any part CAN be made to original dimensions and finish. I maintain a section of photoseries documenting the machining of various parts in an effort to dispel the belief that individual parts cannot be correctly and economically made. All of my photoseries can be accessed from the Photoseries Index page. That section is updated as I make something interesting and a partial list of topics includes: making barrel arbors, winding wheels, watch going barrels, pinions, wheels, etc. Historic Timekeepers specializes in servicing vintage timepieces in a fashion that retains their originality while allowing their owners to enjoy their function. In particular, we routinely service precision portable timekeepers such as: Marine chronometers and deck watches, Aircraft Clocks, American Railroad watches, French Carriage Clocks, Chelsea Clocks, Pocket Chronometers and Chronographs. Of course, we also service fine vintage wrist watches, both manual and automatic wind. Site Created and Expanded since 1999! !